Left to right: Mohammed Bila (LCBC), Andrea Mangano, Marcello Vichi, and the author, discussing plans for Transaqua in the Rome Bonifica office, summer 2015. Dec. 31—Over the past two years, this author has had the privilege of participating in high-level discussions and negotiations to build the largest infrastructural project Africa has ever seen, called “Transaqua.” As a result of this effort, on December 13, 2016, a Memorandum of Understanding was signed in Abuja, Nigeria, between the Lake Chad Basin Commission (LCBC) and the Chinese engineering and construction firm PowerChina, for a feasibility study and eventually the construction of the project. “Transaqua” is an idea developed by the Italian engineering firm Bonifica in the late 1970s. A team led by Dr. Marcello Vichi drafted a proposal on how to solve the Sahel crisis, provoked by the progressive drying out of Lake Chad, which was already producing an increasing flow of refugees into Europe. Vichi’s team came up with the idea of a waterway which would be able to replenish the lake, and at the same time form a giant transport, energy and agricultural infrastructure for Central Africa. The construction of such an infrastructure project would offer jobs for millions of Africans, and lay the basis for future development. The idea of Transaqua is both simple and ingenious at the same time. It has been undisputed that unless Lake Chad begins receiving a major transfer of fresh water, the lake will die, jeopardizing the lives of 30-plus million people who live on its shore. It has also been clear that this water should come from the Congo basin, which is separated from the Chad basin by a mountain chain, running along the border between Chad and the Central African Republic (CAR). The Congo basin, in fact, has plenty of water. The Congo River is the second largest river in the world, with an average discharge of 41,000 cubic meters per second, which flows unused into the ocean. The Bonifica team calculated that 3-4% of that water would be enough to replenish Lake Chad. The problem to be solved was that to bring water directly from the Congo River to the Chad basin, it must be carried uphill. A canal is unthinkable, and to pump the water through pipelines is an effort of gigantic costs, in terms of energy and dimensions. The Bonifica team came up with a brilliant solution: instead of taking water directly from the Congo River, take it from its west bank tributaries at high altitude, starting in the southern region of the Democratic Republic of Congo (DRC) and reaching, by means of gravity, the CAR-Chad watershed. There, at an elevation of about 500 meters, the water would be channeled into the Chari River, a tributary of Lake Chad. In this way, a 2,400 km-long waterway could be built, crossing all west bank tributaries of the Congo River where dams and water reservoirs would be built. As a result, up to 100 billion cubic meters of water per annum could be collected and poured into Lake Chad. It was calculated that half of that amount would be enough to replenish the lake, and the rest would be available for irrigation of an area as large as two times the lake itself. Moreover, the water reservoirs and the dams built on each and every tributary would regulate the river flows, allowing agricultural extensions and generation of electricity. And, by not taking the water all at once from one river, but in small amounts from each tributary, there would be practically no impact on navigability and fishing of the rivers. The waterway itself would be a navigable infrastructure, 100 meters wide and 10 meters deep, stretching from south DRC to the northern border of the CAR. The waterway would be flanked by a service road (necessary for the construction) or, eventually, a railway. In the CAR itself, a larger water reservoir would be built. When the Transaqua idea was presented to Lyndon LaRouche in the early 1990s, he immediately recognized the potential for a productive platform that would change the face of Africa. He made Transaqua part of his international campaign for development. Meanwhile IRI, the state conglomerate of which the Italian firm Bonifica was a part, was privatized as part of the Euro agreements, before even a feasibility study of Transaqua could be done. Dr. Vichi, however, never ceased his battle for Transaqua, and set up a website where all of its records have been compiled (http://www.transaquaproject.it/). The shift occurred in May 2015, with the election of President Muhammad Buhari in Nigeria. Buhari came to power with a program to develop national infrastructure, including implementing a water-transfer project for Lake Chad. On several international occasions, Buhari has made a strong point for solving the problem of Lake Chad, asking Western countries to deliver on promises for financial aid. At the same time, the new government has engaged in an all-out fight against the terrorist Boko Haram, which has been recruiting among poor youth in the Lake Chad region, and even had its bases on the lake. President Buhari has also strongly oriented his government towards cooperation with the BRICS (Brazil, Russia, India, China, South Africa) countries. Nigeria has historically been the leader, with respect to the Lake Chad issue, of the five most affected countries (Camerooon, Chad, Niger, Nigeria, and CAR), which form the LCBC. The Commission Executive Secretary, Eng. Abdullahi Sanusi Imran, is also political coordinator of the International Coalition which, under Nigerian military leadership, has been fighting Boko Haram. Mr. Sanusi’s predecessor had commissioned a feasibility study of a water-transfer project for Lake Chad, but for mysterious reasons, instead of adopting Transaqua, focused on the idea of taking water from one single tributary of the Congo River, the Oubangi. The study, made by the Canadian engineering firm CIMA, concluded that the project was technically feasible, but it would involve a giant effort in terms of costs and energy (water must be pumped uphill for several hundred kilometers) and ultimately, the amount of water would not be sufficient to replenish Lake Chad. To reach this conclusion, which was evident from the beginning, given the limited discharge of the Oubangi River, the Canadians presented a bill of $5 million. 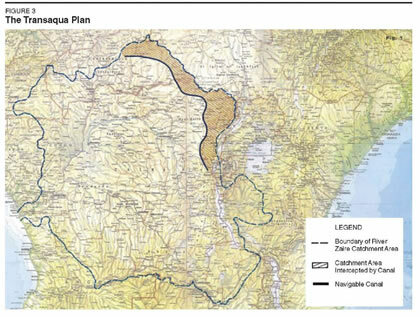 In 2015 the LCBC provided the CIMA study to EIR, which, through assistance from Dr. Vichi and his colleague, Andrea Mangano, forwarded a critique and suggested to drop the Oubangi idea and to finally adopt Transaqua. After an event in N’Djamena, Chad, in November 2014, where EIR had presented the Transaqua idea to the LCBC, EIR organized a first contact between the LCBC and the Transaqua authors in Rome, in the Bonifica offices, on Sept. 5, 2015. As a result of that meeting, a few weeks later the LCBC sent a request to Bonifica for a pre-feasibility study of the Transaqua idea. Details of the offer were eventually discussed in Paris, in December of the same year, among Vichi, Mangano and the LCBC Executive Secretary. It was decided that, in order to begin the project as soon as possible, a study should be conducted to determine how much water could be transferred by building the CAR tract of Transaqua. This, because the Democratic Republic of Congo was not yet on board, or worse, a probably foreign-steered campaign against Transaqua had come from Congo circles in the recent years, using the argument that Transaqua would “steal the Congo’s water.” This argument was silly, especially because Congo would be a net beneficiary of the project by acquiring a navigable waterway, electricity production, and regulation of rivers. The Transaqua authors accepted Mr. Sanusi’s proposal, on the condition that the feasibility study should involve the entire project, so that once the CAR tract is built, the rest of Transaqua could be built just by extension. After some weeks, the offer was delivered, including detailed Terms of Reference and methodology. Mr. Sanusi acknowledged, in a communication to the Italians, that “the Transaqua concept is much more appropriate for the situation of the Lake Chad” than all other solutions. In the meantime, however, the economic situation of Nigeria had dramatically changed and a major financial crisis had erupted. Due to the fall of oil prices, foreign revenues had dramatically collapsed, and Nigeria began to have a negative balance of payments. Furthermore, a new terrorist group, called “The avengers of the Niger Delta,” popped up out of nowhere, sabotaging pipelines and causing a reduction of up to 30% of national oil production. Additionally, international financial circles pressured Nigeria to devalue its currency. President Buhari resisted for months, as he knew that if he did so, this would provoke a major increase of, mostly, imported food prices. Ultimately, he backed down in May 2016, and the situation has been deteriorating ever since. The military campaign against Boko Haram has been scoring major successes, but also draining resources. Nigeria must borrow money from abroad. In this situation, the LCBC solved the problem by bringing the New Silk Road to Lake Chad! PowerChina, one of the largest Chinese multinationals and the company that built the Three Gorges Dam, signed a Memorandum of Understanding with the LCBC on Dec. 13, in which PowerChina commits to finance the feasibility study for the initial stages of Transaqua, as discussed with its authors, and eventually to build the infrastructure. “1. Potentially transferring 50 billion cubic meters annually to the Lake Chad through a series of dams in DRC, Republic of Congo and the Central African Republic. “2. Potentially generating up to 15 to 25 thousand million kWh of hydroelectricity through the mass movement of the water by gravity. “3. Potentially developing a series of irrigated areas for crops, or livestock over an area of 50,000 to 70,000 square kilometers in the Sahel zone in Chad, northeast Nigeria, northern Cameroon and Niger. “4. Creating an expanded economic zone by providing a new infrastructure platform of development in agriculture, industries, transportation, and electrical production, affecting up to 12 African nations. Although the volume of water-transfer specified is half the volume of the original Transaqua project, it will be enough to refill Lake Chad. 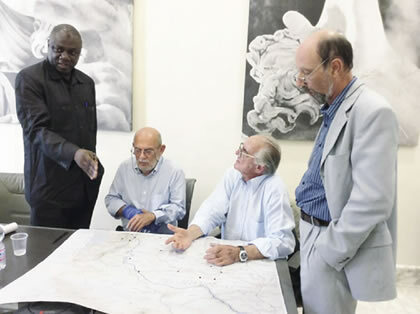 However, it is expected that the PowerChina study will explore the feasibility of building a system of dams and waterways which can be extended southwards in the Democratic Republic of Congo, involving all of the right-side tributaries of the Congo River. In this way, the project will not only be a simple water transfer, but also a major transport infrastructure connecting all nations of central Africa. 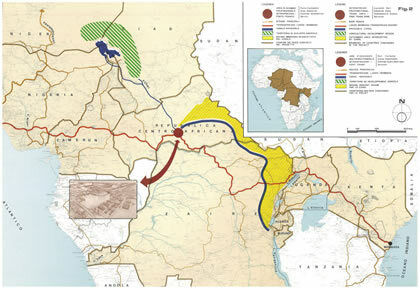 The Congo-Chad Water Transfer (Transaqua): The Main Features of a Feasibility Study presentation to Schiller Institute conference in Berlin, 2010.